Oral-B CrossAction power toothbrushes are on sale for $6.00 this week at Rite Aid. Plus, buy one and receive 200 Plenti Points. The Points are equal to $2.00, which can be used like cash to pay for a future purchase. 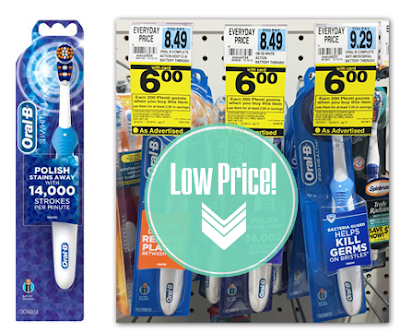 Buy one power tootbrush, and use a $2.00/1 Red Plum newspaper coupon. Then receive 200 Plenti Points to make the final price $2.00! Total $4.00 plus receive 200 Plenti Points, making it only $2 after coupon and points!